Seth is a Lego genius, I'm not sure that everyone see's it and maybe that's because i pay so much attention to what he is doing, being a little brick obsessed myself. But he blows me away with every little build he does and the way he is so creative no matter how small and insignificant to most people these thing are. Seth has become a huge fan of the 'Back to the future' movies over the last year but it wasn't until yesterday that he watched the third movie through. While watching the film he disappeared briefly and returned with his big box of minifigures. I continued to clean the house while he sat and played with Opeie and within five minutes he came in to me looking very proud of himself. 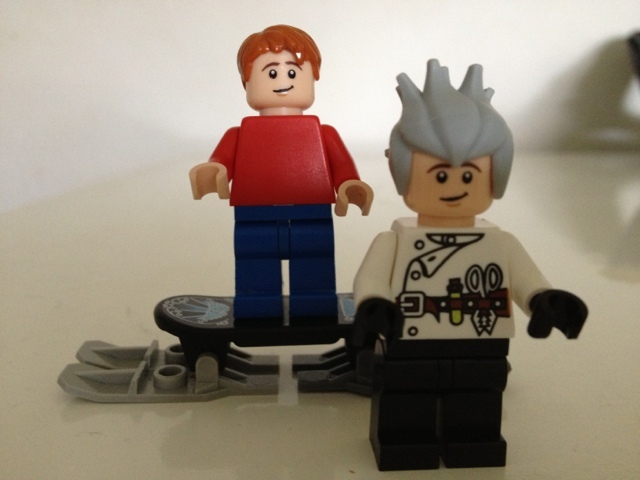 He proceeded to show me his custom Marty Mcfly (riding a hoverboard, of course) and Dr Emmett Brown. Its little things like this that put a smile on my face continuously through the day. Seth can make something of nothing and a lot of thought goes in to everything he does. Keep up the good work Seth I'm so proud of the mini builder you are becoming.